The Business Application Research Center (BARC) publishes “The Advanced Analytics Survey 19”, the results of a global survey into the selection and use of advanced analytics, data discovery and data preparation software. 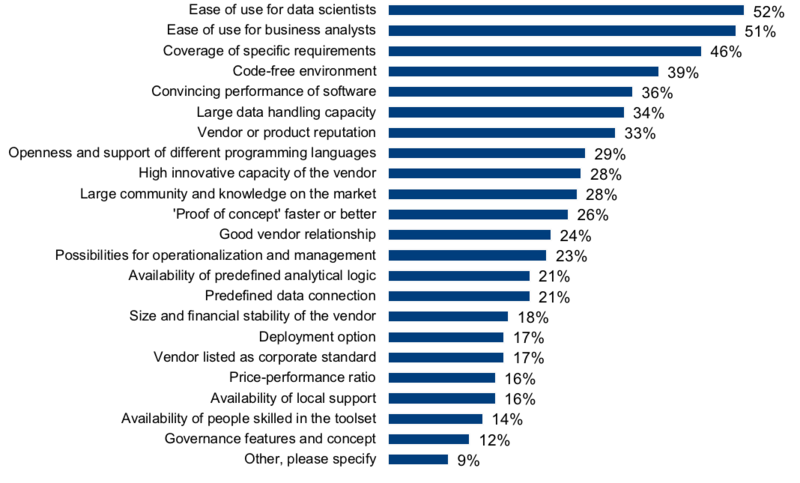 Ease of use is the top buying criterion for companies evaluating advanced analytics software, according to new research from BARC. 52% of companies responding to BARC’s recent survey cited ease of use for data scientists as a reason for choosing their software while 51% were swayed by ease of use for business analysts. Other important considerations for software buyers are coverage of specific requirements (46%), code-free environment (39%) and performance (36%). Buyers are much less concerned about their software’s data governance features and concept (12%). Figure 1: Why did you choose your current software? The levels of benefits achieved by open source users and commercial software users are generally comparable but with some notable exceptions. 48% of users of commercial analytics software achieve increased transparency of data usage to a high degree while the corresponding figure in the open source community is only 36%. Increased employee satisfaction is also felt more acutely among commercial software users. Figure 2: To what level have you achieved the following benefits with your open source software? Figure 3: To what level have you achieved the following benefits with your commercial software? 71% of open source users rate their data preparation, visualization and machine learning functionality as excellent. This is significantly higher than the 35% of respondents who say the same of their commercial products. However, commercial software has the edge when it comes to governance, user guidance and collaboration. Only 52% of open source users rank their governance capabilities as excellent or good, compared to 69% of users of commercial products, and the corresponding figures for on-screen user guidance are 50% (open source) versus 79% (commercial). The Advanced Analytics Survey 19 is a new BARC research study focused on the advanced analytics, data discovery and data preparation software tools market. It is primarily based on a survey of 677 software users and consultants worldwide, and provides a wealth of feedback on software selection and usage patterns as well as comparative analysis of ten of the leading advanced analytics solutions on the market today. Click here for further information. The Business Application Research Center (BARC) is an enterprise software analyst and consulting firm with a focus on Analytics/Business Intelligence (BI), Data Management, Enterprise Content Management (ECM), Customer Relationship Management (CRM) and Enterprise Resource Planning (ERP). Along with Ardour, Le CXP and PAC, BARC forms part of teknowlogy Group – the leading independent European research and consulting firm in the fields of digital transformation, software and IT services with a network of 155 experts in eight countries.